A Red Robin employee is accused of filming a 15-year-old customer at a urinal in the restaurant's bathroom -- and the boy's family says the store manager refused to contact police when they reported inappropriate behavior. The 15-year-old was in bathroom at the Fair Lakes Shopping Center Red Robin Dec. 26 when he noticed a figure over his head and a cell phone pointing at the urinal, police said. The phone appeared to be recording, police said. When the boy confronted the person filming, he noticed they were a restaurant employee, police said. The boy then left the bathroom and told his mom. 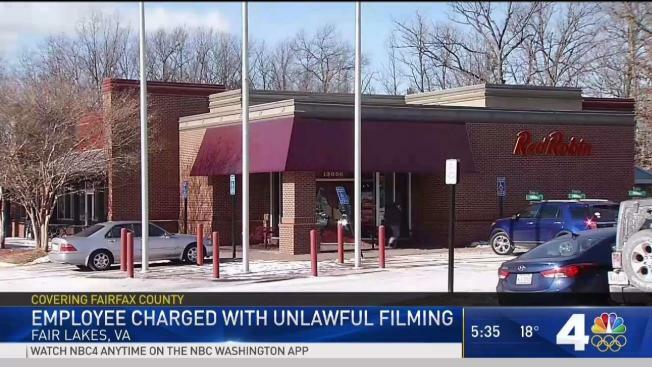 His mom notified the restaurant staff about the filming and then left the Red Robin -- but, according to court documents, the manager refused to contact police. The documents say the manager said he would talk to Red Robin's corporate offices about the alleged unlawful filming. The family left the restaurant and called police on their own. Police then went to the restaurant to investigate. The Red Robin employees refused to give officers more information about the suspect, police said. "Red Robin has and continues to fully cooperate with authorities in this matter," the company said in a statement. The next day, detectives from the Child Exploitation Unit executed a search warrant and identified a suspect: a 17-year-old from the Herndon area. Police expect to charge the suspect with marijuana possession and unlawful filming of a minor. Police won't release the name of the suspect because he is a minor. Anyone with a similar experience at the restaurant is asked to contact police.